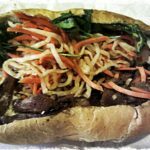 Hidden behind a little strip mall on Aurora you can find some truly unique and delicious Banh Mis. 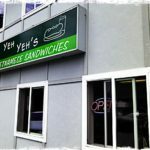 Located a little North of the city in Lynnwood, Yeh Yeh’s has created quite a following despite only being in business for a few years. I guess that’s what happens when you make great food…if you make it, they will come. The first time I came here was before all the foodie hype about this place. I though I was just going to any old cheap Vietnamese deli. 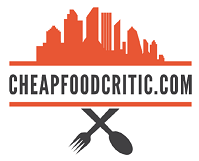 This was dispelled very quickly as I was surprised to find out how how much more in price the sandwiches were compared to other place in the Seattle area. I just assumed it was a premium for not being in the International District. However, after getting my food I realized the price difference was actually because you get a much larger sandwich filled to rim with meat and veggies. Although still cheap I can still remember the good old days when you could get banh mis for $1 each and if you bought 5 you would get one free. 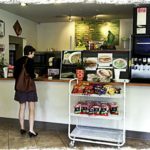 As I stated, the banh mis themselves are a little different from other places in Seattle, don’t come here expecting the same sandwiches like Seattle Deli or Saigon Deli. 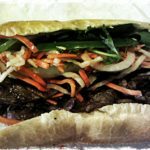 Some of the the more noticeable differences include the use of a different bread than most of the other local Vietnamese delis, the much larger sandwiches, as well as a different ratio of fillers for their sandwiches. Overall its a nice little twist to the Vietnamese sandwich without sacrificing its authenticity. My most recent trip here I ordered the Grilled Chicken and the Grilled Pork Sandwiches. My order did take a little longer because of the lunch rush. Next time I will definitely call it in first. For both my sandwiches it was $8.42 after tax. 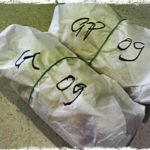 The sandwiches were both filled with meat, cilantro, jalapenos (optional), onion, as well as pickled daikons and carrots. Also, the bread was fresh, soft in the inside, and crunchy on the outside if eaten right away. But the bread may get a little soggy if you wait a little bit to eat it. If these guys were not unique enough they also have a Pastrami and Philly sandwich…I am intrigued. I can’t wait to come back and see what type of Vietnamese twist they added to these classic sandwiches. Note – Parking maybe a little tight; the tiny parking lot is shared with the Asian grocery store next door. 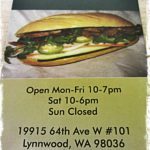 If you are a little further south in Shoreline try out iSandwiches also.